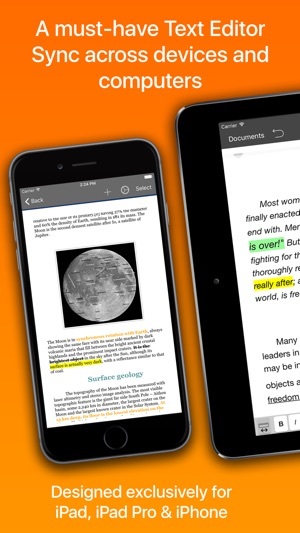 TextEdit+ is an sleek and fast text editor for your iPad and iPhone. It's compatible with the text editors that comes as a part of macOS (TextEdit) and MS Windows (WordPad). It also supports any RTF, TXT, Markdown or LaTeX editor like Nisus Writer, MacDown or TeXStudio. If you don’t write all the time, then you probably don’t need a full-featured word processor, such as Microsoft Word or Apple Pages. But you still may want a flexible tool for handling text. You know what? You already have one: TextEdit+. TextEdit+ is your white, plain, blank sheet of paper that is always with you on your iPad or iPhone. Simple but very quick, easy to use and useful. Also TextEdit+ can sync and share your documents across devices and your Mac or Windows computer via Files app or iCloud. - Less is more. No cluttered user interface. Just focus on your creation process not the tool. - Quickly move around the cursor. Quick keys for tab, forward delete, up, down, left, right, etc. Customize our extended keyboard with your own keys. - Bold, italic, underline, line spacing, highlight, indents, subscript/superscript, alignment, lists, type size, text and paper colors, etc. 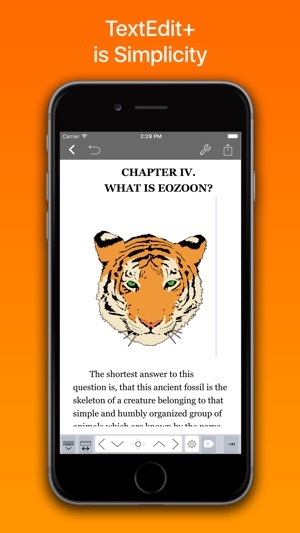 - Characters, words, syllables, reading time, sentences, average word length, Readability Index, etc. TextEdit+ is the best choice for writing text documents right on your iPad. --- Thanks for all the helpful feedback! Let us know via mail (contact@ studio5apps.com) if you run into any problems or have feature suggestions --- If you like TextEdit+, please take the time to give us a nice review: it really helps. 3.5.0 - New app icon design! 3.4.0 - Now you can set your document margins, first line indent, line spacing, paper size, etc. 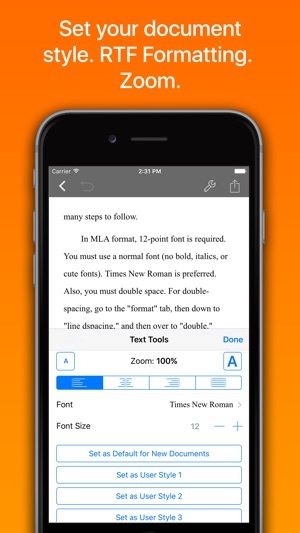 3.3.0 - Now TextEdit+ can open and edit documents in place using the iOS Files app. Open macOS TextEdit documents directly from its iCloud Drive folder! TextEdit 2.7.2 - iOS 11 Files app document providers supported. 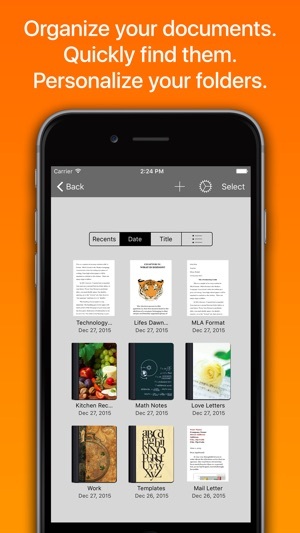 You can now open/save all kind of documents directly from the new Files app, so TextEdit+ can now access any iOS document provider like OneDrive, GDrive, Dropbox, Box, webDAV, etc. - Fixed several bugs and improved performance. 2.5.0 - Ads have been removed! I keep notes using TextEdit on my Mac and was looking for a way to edit them on my mobile devices. I use textedit’s Alt-Tab shortcut for creating bullet points and outlines and its Ctrl-K shortcut to link text to web pages. TextEdit+ rendering of the resulting RTF document was completely unacceptable: the indentation was incorrect, the spacing between paragraphs was way off, and links appeared with a leading “<“. And on top of that, the app claimed that it can’t edit the document because tables are currently not supported — even though my document doesn’t contain any tables. I very much regret having purchased this app, especially as expensive as this one. I have been looking for a way to edit TextEdit files on iOS for a long time and waited to see if Apple would do it but they seem to be too focused on Pages. This app fills that need for me and it is a better solution for me than other text editors like Ulysses and Google Docs. Thank you and keep it up! Full preview of LaTeX documents does not work. The app just quits on the first attempt is hanging forever if try again. Even on the included example. Also, free upgrade to NoticeWriterPro is deceiving - it tricks you to installing a free version and you have to pay to get pro.